"Are you going to replace it with a mural of apartments?" Today is graffiti removal day in NSW, a fun day on which thousands of volunteers get together to rid the state of tags and unauthorised street art. 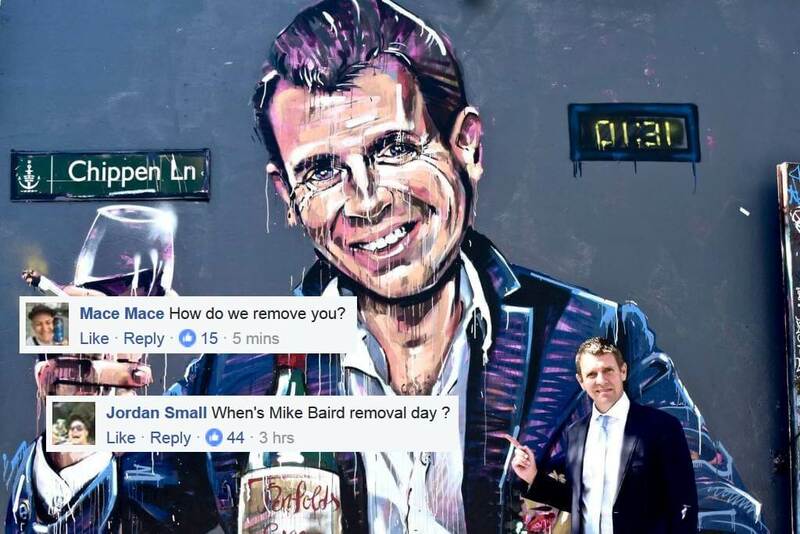 To celebrate the occasion, Premier Mike Baird posted a tongue-in-cheek photo of himself on Facebook standing next to a mural of his much-maligned alter-ego, Casino Mike. The mural, which was painted on a wall in Chippendale by street artist Scott Marsh in response to the Sydney lockout laws and the exempt status of certain casinos, shows Baird sitting in front of a stack of poker chips clutching a kebab in one hand and a glass of wine in the other. “Did you know that NSW has an official “graffiti removal day”? Well, it does. And it’s today. And love it they did, in the sense that it gave them yet another chance to roast their Premier alive. In four hours the post has already racked up more than 2,100 comments, and if you’re in need of a good laugh this afternoon then look no further. “This is the type of rubbish we don’t need in our streets, it’s the reason why we as Australians are looking bad…oh and a mural,” remarked another. “Are you going to replace it with a mural of apartments?” asked a third. A number of people also pointed out that the mural in question was actually painted over months ago, meaning that Baird has presumably been planning this joke for a while. Fortunately he nailed it, otherwise this could have been really embarrassing.